This post is from last year on my math teaching blog. Presently we (along with much of the American Midwest) are in the middle of a serious cold snap. So I have edited and remixed it for the Talking Math with Your Kids audience. This morning’s situation. Colder air is on the way. Griffin (8 years old in this story) and I play a little game called Guess the Temperature. It goes about how you would expect. We step outside on the way to his bus. I ask him to guess the temperature. If I don’t already know, I get to guess after he does. If I do already know, I don’t cheat; we just remark on how close his guess was. In Minnesota, in winter, this means we get to study both positive and negative numbers. Me: Griff, guess the temperature. Griffin (eight years old): Two below zero. Me: It’s three degrees above. G: So I was off. Me: Not by much, though. How much were you off by? 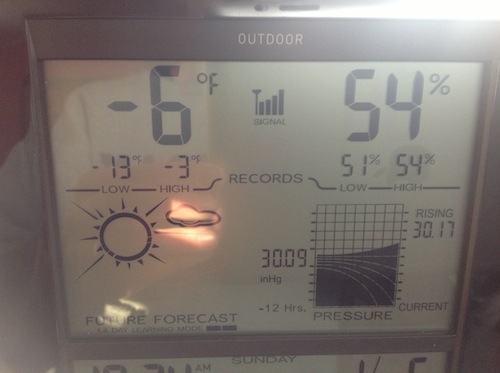 G: [muttering to himself, then loudly] Five degrees! Me: How did you know that? G: It’s two degrees up to zero, then three more. Me: So what if it had been 10 degrees out, and you guessed 3? G: [quickly] I’d be seven off. Me: Right. How do you know that? G: Ten minus three is seven. Me: Nice. Subtraction. Do you know that you can always express the difference between your guess and the actual temperature with subtraction? So in that last example, you subtracted your guess from the actual temperature. You could do that with your real guess today. So three minus negative 2 is five. By this time we were nearing the bus stop. Griffin’s silence seemed a clear sign that he was ready to move on. Two things are important in this conversation: (1) Griffin’s solution method, and (2) the connection to subtraction. Griffin’s solution method. Griffin’s strategy is a common one for children to invent. He uses zero as the boundary between positive and negative numbers. To compare how much bigger a positive number is than a negative number, you have to cross that boundary. You have to go past zero, so it just makes sense to him to divide the distance into two pieces—the part to get to zero, and the rest. We live near a major road—Arcade Street. We often use it as a boundary for our neighborhood. So the local recreation center is three blocks on the other side of Arcade; plus the one block to get to Arcade. That’s four blocks total. Talking in this way about everyday navigation supports thinking about temperatures, which in turn support thinking about integers. Connection to subtraction. From years of teaching middle school (and—to be honest—college), I know that subtracting integers is tough going. The rules for solving don’t seem to connect to students’ experiences with numbers. Notice how quickly Griffin connects the 10° and 3° situation to subtraction, while not seeing that subtraction applies to the 3° and -2° situation we started with. Perhaps my mentioning that these are the same will lay the groundwork for him noticing it in the future. In the meantime, we learn that learning subtraction is a lot like learning division. In a recent post, I showed how Griffin thought differently about division depending on the numbers involved and on the context for thinking about it. Now we see that this is true about subtraction, too. 10-3? No problem. 3-(-2)? Problem. Children—all children—develop mathematical models of their worlds before they study them in school. Parents have opportunities to support this through conversation. Talk about landmarks, way stations on your journeys. Mileposts, subway stations, bus stops, blocks…these are all opportunities to help children build the mental models necessary to think about zero as an important landmark. Talk about distances. How many blocks is an example from our family life. How many subway stops came up for girl I observed in New York City last fall. How many pages did we read in our book is another example where subtracting endpoints is helpful.